Watermakers, like any other modern shipboard system, rely on their electronics for continued trouble-free operation, monitoring and automated self-maintenance. 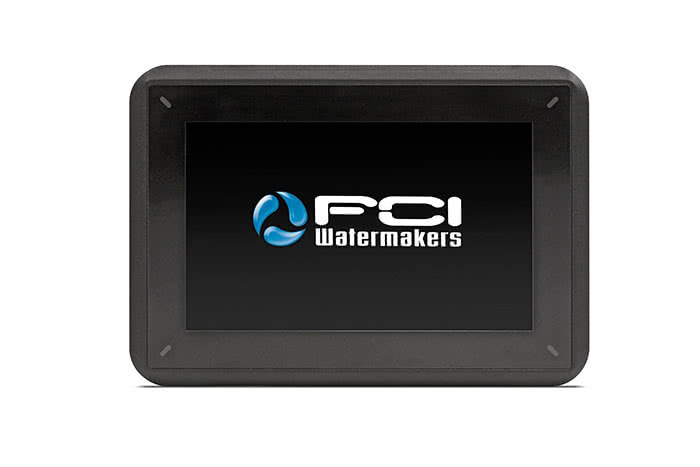 Already the benchmark of the industry, FCI Watermakers has enhanced its feature-laden V4 Controller. FCI upgraded V4 Controller’s the rock-solid firmware. The improvement increases screen response speed and provides an enhanced graphics-based visualization, or HMI (human machine interface). Using the V4 Controller is simple with its intuitive menu. Accessed through a hi-res 7″ or 4.3″ HMI touch screen, users can set up automation processes, such as fresh water flushes, customized for the individual application. Instructions and on-screen help is built into the device for easy troubleshooting. Resistant to extreme heat, the monitor itself is built for real-world use. Guaranteed to not interfere with other on board electronics, it is the only such device that is bridge classified for marine use with type approval certifications from the ABS, DNV GL, Lloyd’s Register EMEA, Det Norske Veritas and the Russian Maritime Register of Shipping. With MODBOS communication protocol, the V4 Controller is simple to connect into a vessel’s network, makes adding a second touch screen straightforward and has a unique IP address for remote access. It’s also NMEA 2000 compatible. Built in the USA, proven FCI Watermakers are on thousands of recreational, commercial and naval vessels worldwide. They range in capacities from 200 to 260,000 gallons of water production per day.